About four days ago, I began hearing some Dog Day cicadas calling. They seem to be most active in the late afternoon, early evening. After three days of attempting to photograph and/or capture a specimen for your perusal (they are extremely flighty), I've finally managed to nab one by waiting until nighttime; Then, using a ladder and a flashlight, access the higher branches where they seem to prefer hanging out overnight. Anyway, I believe this is a Tibicen tibicen. However, I'll leave it for you to definitively identify it. By the way, this guy is slightly larger than the annual Tibicen pruinosas (sp? )I have in my bug collection from last year. Awesome photos. You are correct, this is Tibicen tibicen (formerly Tibicen chloromerus). If you look closely at the first photo you will see right behind the compound eye, there is a mite on this specimen. I'm sure you realized that this is a male when you caught it, I would imagine it gave out a large squawk. Your method for catching cicadas is quite novel. Climbing up a tree at night in the dark is very cool. How long did it take you to find this guy? I may have to add that as a method of catching cicadas in the "How to" section. Thanks for sharing your photos. Please provide more in future. Yup, he was a squawker all right! I didn't notice that mite until you pointed it out. You've got some sharp eyes there! As for the ladder/flashlight technique, here's how I do it: I go outside right before sundown and listen for cicadas calling. I then take note of the trees they are in and the approximate area where the sound is coming from. Then, a couple hours after the sun sets, I head back outside with a high-intensity LED flashlight and an 8-foot A-frame ladder in tow. I then position the ladder under the area where I heard the cicada calling earlier and climb up there with the flashlight and start hunting by slowly sweeping the beam along the branches. 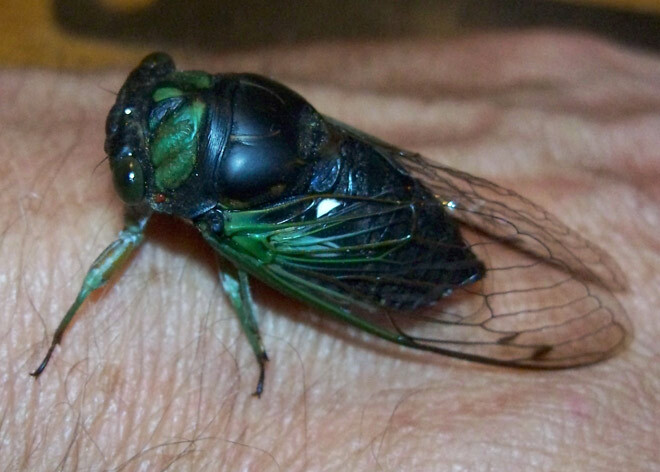 It doesn't take more than a few minutes to find out if the cicada is still there or has moved on. The T. tibicen shown here was spotted within two minutes of searching and was pretty much near the same area where I had heard him calling earlier in the evening. I just had to reposition the ladder a little closer to him and climb back up to grab him. Surprisingly enough, last night while using the same ladder/flashlight technique, I caught a female T. pruinosa (at least, I think she is a T. pruinosa). 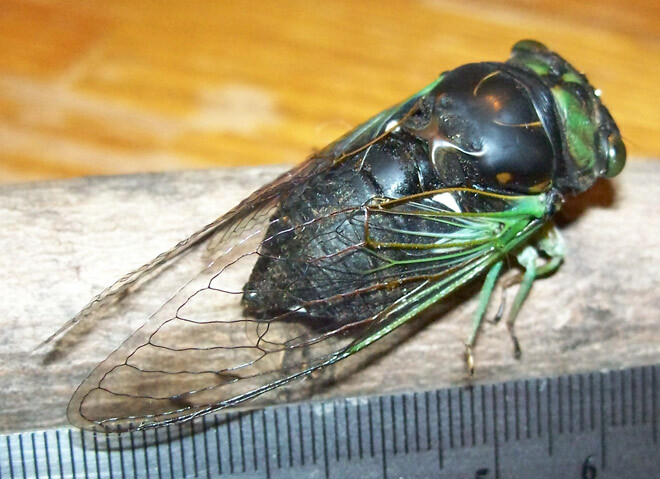 I say "surprisingly" because I was fully expecting to catch the male which I had heard earlier in the evening and was not at all expecting a female cicada to be awaiting me! Try as I might, the male was nowhere to be found.